Happy New Year! Well officially as we do this we are still in 2010 but many of you may not see this until it is the new year! Mum went off to day hunt as usual today but got home a little bit earlier that usual. She came home with a bag full of foods to eat. A big container of soup that just went into the big cold box. Mum loves their egg drop soup and says it it cheaper than her making it. Here is the stuff all out on the plate, chickhen, chickhen and more chickhen. Appetizer, lo mein and flied lice! She got several fortune cookies, this is the one she opened tonigh. She hates hats so trust me it she won't be getting a new hat. 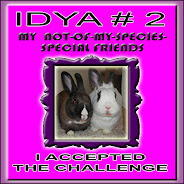 Guess Ducky and I will pop around the blogosphere and find a a party to two to stop in at. On Caturday we will be thinking Roses. First we will watch the pretty parade with all of the flowers, then later we, well at least mum, will be watching the Rose Bowl game. Whiskerconsin's Bucky Badger will be playing some frogs! Mum used Grampies little Christmouse tree. It has jingle bells on it for us to play with. Such a sweet card with Miss Praline on it. A box with lots of little stuff inside, mum didn't help us unwrap the prezzies right away. Said we needed to wait. Then will all of the stuff with Grampie we didn't get to it until Christmouse Day. Mine, all mine. Well OK, we can share as there is lots to share. All sorts of toys, nip, special nip toys and some training cards for mum. Mum put some of the nip in our one nip toy and the one we got. Derby got right at it and bunny kicked and licked it. I like this little fevver toy. It sticks to the big window and with the heaty spot nearby, it sways in the breeze. Then I attack it. Mum says there will be more prezzies, but something has to come yet from the guy in the long blu shorts. Then we will have Christmouse again, really soon! The Pack - Beat them Giant's today, still has a chance at the playoffs, but that means beating Da Bears next week playing at Lambeau on the frozen tundra. The team looked good today. Grampa Brett and the ViQueens - not having much luck with the weather guessers. This week they had their game postponed due to snow. I think it would have been fun to watch them play in a blizzard. Maybe not fun for the fans to get to and from the game, but the game itself would have been cool in the snow. The Colts - Won today out on the left coast against the Raiders. Thanks to all of you who have stopped by with your kind words on Grampie. Mum said it was nice that he was "Home for Christmas" his heavenly home that is. He is now with his loving wife, Mae who has been waiting for him for a furry long time, 23 years, for him to join her. They sang this song at his funeral, the third verse is particularly good, Grampie has had his second birth. Grampie went to heaven this morning. Mum was told that Puddin' was sitting outside his room so he had a little ginger boy to purr him home. We will have our paws full with mum so will be offline for a while. We are keeping warm just fine, last night we were all in the sleepy spot at the same time. Mum woke up and turned over, then Derby left. I had mum all to myself. Neither Ducky or I have darkly trimmed eyes. Some cats do, even some mancats. We had rain, some snow, lots of wind and furry cold now. Mum got what little snow we had off the end of the driveway before the plowed stuff froze. Then she came inside to stay warm, watch fevvers and feetsball with us. Ducky helped to keep mum warm by sitting on her legs. Sammy and Andy asked for winter pictures, here are a few from Sunday, they don't get much snow down in San Antonio. Out the back looking towards the fevver feeders. Out the kitchen windows towards the neighbors house. Our Secret Paw arrived too, from Sweet Praline, more later. Mum opened the box for us, but did not help us open the actual prezzies yet. The Pack - losted to those Lion guys from the Mitten state. Was a strange, low scoring game. Plus the QB ARodg bonked his head on the ground and didn't play the last half of the game. Mum says it is not likely for the playoffs for the team. Grampa Brett and the ViQueens - will now be playing on Monday evening in Detroit against the Giants. The weather messed things up for them first, then the roof on the stadium broked. You can go here to see video from inside during the collapse. Mum thought it was kinda cool. Plus towards the beginning she thinks she sees beans running along the far sidelines. Probably to get somewhere safe. The Colts - played last Thursday and won. No drama as far as we know. We sent mum out shopping yesterday for our Secret Paw items. She did a good job on the shopping, then was so efficient putting the box together, she didn't get our purrsonal message inside. Oh well.... Hope the recipient likes it. Mum also took off with her furiends Miss Jane and Miss Lynn. She came home with AlPacka socks, fudge and an ornament for her Secret Paw exchange at work. They had a good day to drive around. Mum got her package with the tippy straps for the big picture box, now she has to get it hooked up. Maybe later today after she comes back from visiting with Grampie. 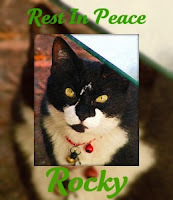 We just found out that Rocky went off to The Bridge, but not after giving his family cooties. Way to go Rocky, Farewell, have fun at The Bridge. 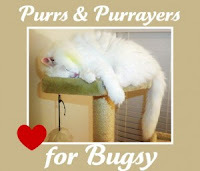 Purr for Bugsy, he has GI troubles, those are never fun. Purrs for him too. We is just chillin', watching fevvers out the windows and waiting for the snow to start falling from the sky. We won't get a lot, but it is supposed to get furry cold next week again. Remember the fevver box where Grampie lives? Well mum found out what kind of fevvers. Seems she walked past this, who knows how many times, before she actually noticed it and read it! Duh mum! (Biggify to read it better). Go back here to see close up pictures of the fevvers. Plus when she was there, she did notice Pudding sitting in front of the fevver box, tail twitching, so he is aware of them. Probably figuring how he can get into that box! Mum didn't take any pictures of this since other beans were there, didn't want to take away their privacy. Mum is spending way too much time away from home in the evenings. Tonight she said she was off to be bored of the library, so then why did you come home with snacks and an empty wine glass? Hiya, Ducky here! I like this quote a lot. Mum when she is in her sleepy spot lifts the covers and invites me into the cave. I go in sometimes and snuggle against mum's belly. No bad things happened to me cuz of the picture box. Mum is looking into how she can make it so it won't tip over. Derby and I always do our purrs with mum, morning and night. We purr for all the kitties we know, their beans, our family and of course that all kitties find a loving home like we have. 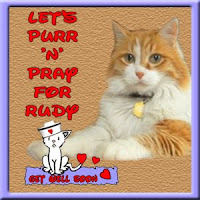 We need to add some super special purrs for our ginger buddy Rudy. He has something in his blood called, Haemobartonellosis. Phew, big word for such a little kittie like me. Rudy needs to take medicine and visit his VET every couple of days. We hopes he gets all better soonest. We got just a little bit of white stuff from the sky on Caturday, not much, no issues for mum to get out to go shopping and such. Mum? Where are you taking this box? That is my play box! Oh, temporary use to take a few Christmouse decorations for Grampie. That is good, he needs Christmouse cheer too. After putting out the stuff for Grampie and visiting, she ran into Puddin. He was checking our the box. He probably got a sniff of me and Derby. This was the best that mum could get of his face. Derby helping mum watch the feetsball game. mum spent lots of time in the kitchen making this. Nommy, at least for bean, peanut brittle. The Pack - they beat them gold digging Nothern Catifornia Forty-Niners. Grampa Brett and the ViQueens - Well the ViQueens won, but Grampa Brett left the game injured really early in the game. The Colts - Them Cowboys tamed those horsies but they had to go into overtime to do it. Yep, he really screwed up now. This Wednesday AM, mum was getting her breakfast and mine when we heard a big crash. We don't know how he did it but he knocked over the big and NEW TV. Mum just got this last Wednesday late afternoon, spending some of her hard earned green papers. It still works OK, but if you look in the above picture below and to the right of Ducky's face you will see a white mark. So the screen has a scratch on it. That isn't a flaw in the photo. Mum was really upset, but she is happy it works OK. Now she has to figure out how to anchor it so he can't do this again. Hey, it's Ducky. I didn't mean to make the crash. The old picture box was bigger, wider and I could jump on it. I didn't know my own strength here. Plus if mum hadn't had her fake, ceramic pumkins sitting there it wouldn't have scratched. The scratch came from the pumpkin thingy. Plus if the picture box is working you can't really see it much, it is down in the corner! I will be OK, at least it still works!!! Plus mum isn't watching much anyway, she has a pile of Christmouse cards to work on. She has to do both her and Grampie's. She spent most of last evening doing them and needs to work on them now too. Guess we better go snoopervise some more. What a mess on the table, it should be cleared off soon. HEHEHEHE. Ducky got the boot out of the sleepy spot last night. Four times he circled around mum as she laid trying to sleep, he wants to snuggle and plops his tocks right on mum's face. First she gently moved him off, moved her head. Each time he came back to snuggle, sit on her face she moved him off again. Finally she sat up, picked him up and put him on the floor. After that he left her alone and she could get her sleeps. He was nice on Caturday when he got all of his snuggles, but didn't actually sit on mum's face like he did this time. Yeah, the runt isn't purrfect! She got home furry late, stuff at work to do, quick trip to see Grampie and then home to us. I had to watch in the front window until she brought the metal monster into its room. I am ready to snooze on the back of the couch. A plus, we gots ham tonight. The Chinese philosopher Confucius owned a cat and always kept it by his side. He apparently believed that the cat was sent from heaven to serve as a conduit for divine wisdom. Hiya, Ducky here. Hope everyone had a good holiday weekend. We did! We got lots of sleeps, treats and snuggles. But no turkey! We lot lots of other noms but no turkey. Mum did not cook a turkey and ate her turkey meal with Grampie on Thursday. Caturday before mum got up from her sleeps I jumped up on the sleeping spot and laid down right by her with my bum in her face! She moved her head just a bit, but then had both of her arms out to encircle me like the little green nap bed. We just snuggled for the longest time which was nice. Derby just sat on the floor and watched us. Finally mum had to get out of the sleepy spot so she could go foods shopping and do the washy routine with the monsters in the basement. Derby did his best to soak up some solar power. With the short days we have to get the sun while we can. These front windows get lots of sun in the AM, the kitchen windows get it in the afternoon. 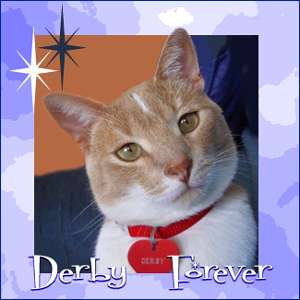 Derby is so much bigger than I am, he needs more solar power than I does. But if there is no solar heat to soak up we just hang out in front of the heaty spots near the floor. There are lots of them so we don't have to fight over getting a spot to be warm. Here is our back yard, we can sit here and watch the fevvers with mum as she counts how many come to the feeders each weekend. It may be bright and sunny but it is cold out. Mum got out her warmer coat this past week. Grampa Brett and the ViQueens - The won with their new coach against the Redskins in Washingtown. The Colts - Playing on Sunday night and behind to The Bolts at halftime. Mum will have to see if she stays up late to see the end of the game. Probably not, she has been nodding off all evening. Buckingham U Badger's feetsball team will be bowling, most likely for Roses on New Year's Day. Won't know for sure until next Sunday! Hope your Thanksgiving Day is filled with the warmth of the day, from the heat of the oven. Stuff the turkey, not yourself! Don't lose your turkey either! Mum got her annual goody bag from work, it was a small box with a nice cloth bag. A bag that mum could use for shopping or carrying stuff around. Plus the goodies inside! Pancake mix, real maple syrup, granola, cider jelly and maple apple spread. Mum is specially happy to get the real maple syrup. Her company send out the gift baskets every year at Thanksgiving to the employees. Mum says we will have a quiet day and she will go eat dinner with Grampie. Thanks for all your comments on Puddin. Mum hasn't met the other kittie Mr B, a black kittie. Guess he likes to hide! Where Grampie lives they have kitties, two on the first floor that we introduced to you back here and here. Upstairs they have another two kitties, one which is a GINGER boy! The ginger boy is named Puddin. Top side view, sort of blends in with the wooden floor. This was the best one mum could get of his face and eyes. He didn't want to give mum a full face pic even without the flashy. Pudding is good about moving between the wheelchairs. Tail up so it won't get rolled over accidently. Moving towards the outside windows in the sunroom, don't know why they call it that, there was no sun puddles in these pics. Looking outside to check on whatever is happening. But for Puddin he doesn't have to watch outside to see fevvers. This big box contains inside fevvers! Mum says Pudding must be bored with these fevvers as he doesn't sit there and try to get them or chitter at them. Mum isn't sure what kind of fevvers these are as they aren't in her wild fevver book. But is is nice for the residents to come and watch them fly around. Mum wonders if there are both boy and girl fevvers and if they have babies.